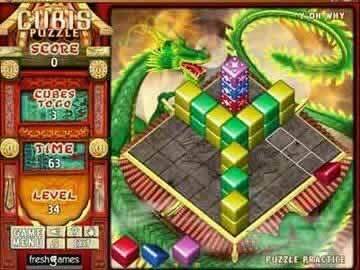 Cubis Gold Game - Download and Play Free Version! A simple, highly charged arcade/puzzle game that is played in all three dimensions. 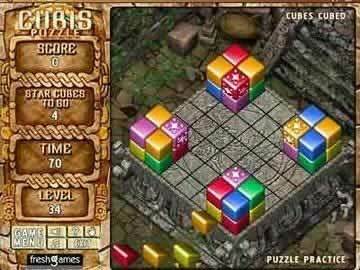 CUBIS Gold is a simple, highly charged arcade/puzzle game that goes beyond 2D point-and-click games. 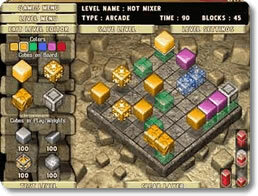 CUBIS Gold's unique 3D board engages the player with colorful cubes that must be removed against the clock by matching three or more in a row, vertically or horizontally, not diagonally. Score BIG with a chain that sets off another chain and you have a CUBIS! Move fast as you skillfully make chains of three or more cubes to remove them from the 3D board. Unlike anything you've played before, you'll spend hours enjoying this all-new twist on computer puzzle games.